Our creatively designed one bedroom floor plan features a gourmet all electric kitchen with a refrigerator, vertical and mini blinds, and is cable ready. These apartment homes are sure to please and inspire. It's time to enjoy living. Come home to Valley Ridge today!  Valley Ridge offers a peaceful haven for its residents. The peace and privacy of our community and easy access to local freeways and shopping are just a few of the benefits that our community provides. There is a convenient laundry facility for those everyday chores, and we welcome cats, so bring your furry friend and discover a new way of life!